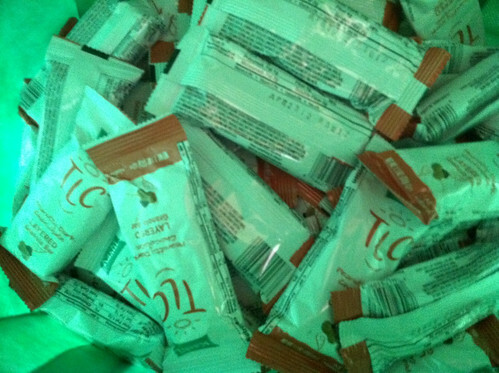 home is where they send us...: Kashi Granola Bar Review! I was given an awesome opportunity through Kiwi Magazine's Mom's Meet Program to sample Kashi's all natural TLC® Peanutty Dark Chocolate Layered Granola granola bars. (Small) Disclaimer: I received this product for free from the sponsor of the Moms MeetSM program, May Media Group LLC, who received it directly from the manufacturer. As a Moms MeetSM blogger, I agreed to use this product and post my opinion on my blog. My opinions do not necessarily reflect the opinions of May Media Group LLC or the manufacturer of the product. I'm sure most of you are aware of Kashi and what they stand for - REAL food. They make their food with lots of whole grains, proteins, fibers, real fruits & vegetables, crunchy nuts and of course: NO ARTIFICIAL INGREDIENTS. The last ingredient...or I should say, lack of ingredient is why I started buying Kashi products for my family. Over the past few years, I have tried and enjoyed many Kashi products and was excited to test these new granola bars with my family and my friends! 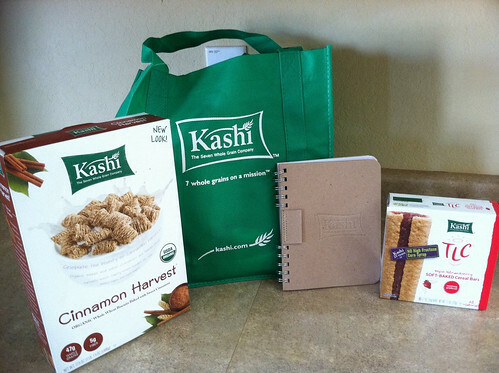 I was excited to get a packaged FILLED with lots of great Kashi products - a new cereal I had yet to try, lots of granola bars to share, my kids absolute favorite cereal bars (TLC Ripe Strawberry Cereal Bars), a reusable bag and a cool notebook. It was heaven! I even received some materials about the Kashi products and ideas for using them. Who knew you could take a cereal bar and put it in the microwave for a few seconds to make it taste like warm strawberry pie? It works...really - and little man and his sisters love it! The kids were excited by the large bag FILLED with granola bars. Of course, I was going to share these with my Mom friends HOWEVER I needed to test them first in my house so I knew what they were like. The girls ripped them open and devoured them in seconds. Gator declared they were her favorite granola bar ever...Peanut, on the other hand, liked it but didn't love it. And, little man did not taste any because they seem to be a bit too chewy for him. When I shared them with our Mom friends and other kids the feedback was almost completely positive. Everyone knew about Kashi products and loved what they stand for. All the Moms want the same thing for their kids, good food and healthy ingredients, and the kids wanted something that tasted great! There were a few kids who did not enjoy the granola bars. I think this was that they are not used to the dark chocolate taste, possibly that holding the granola bar for any extended period of time in a sweaty hand made the chocolate melt and become quite sticky or the overall chewiness of the granola bar. Many children who loved them had no problem expressing their love as they asked for more! When I tried the granola bar I was a little disappointed. It seemed that it was a little chewier than I had been anticipating and quite sticky. I think the dark chocolate coating gave it a little too much sweetness but then I thought about how much the kids liked them (and my husband) and realized it might just be that I have been going through some major diet changes in my own life (cutting out the white flours, added sugars, etc) and perhaps it was just shocking to my system to have something so sweet. I would say, 90% of the parents and kids I shared these with were in love. With those kind of odds I cannot help but give two thumbs up to this excellent product. Especially since it is made of nutricious ingredients that can start any child off in the right direction (diet/nutrition wise). 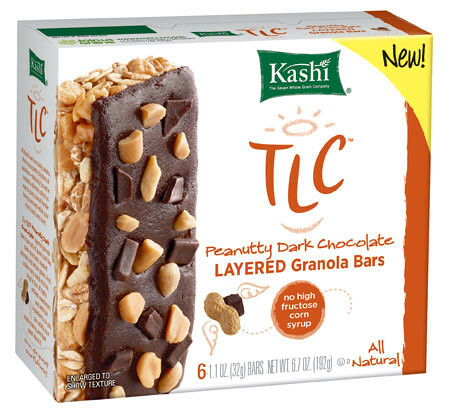 For more information on the Kashi TLC Peanut Layered Dark Chocolate Granola Bars go here. For information on Kashi you can find them at their website or on facebook.